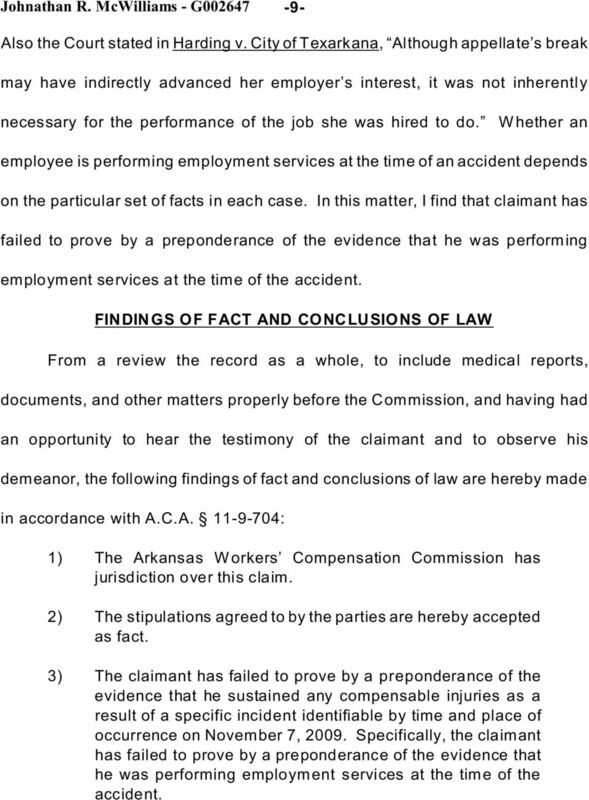 Download "BEFORE THE ARKANSAS WORKERS' COMPENSATION COMMISSION WCC NO. G JOHNATHAN R. MCWILLIAMS, EMPLOYEE KEY CONSTRUCTION, LLC, EMPLOYER"
2 -2- relevant times, including November 7, ) Claimant s average weekly wage at the time of the incident was $ per week, which would entitle the claimant to a temporary total disability rate of $ per week and a permanent partial disability rate of $ per week. 4) The parties agree that the actual body parts that the claimant injured on November 7, 2009, were his right foot, left heel, and a compression fracture at T11/T12 in his back. The parties agree that there are not any compensable injuries to the claimant s neck or knees. 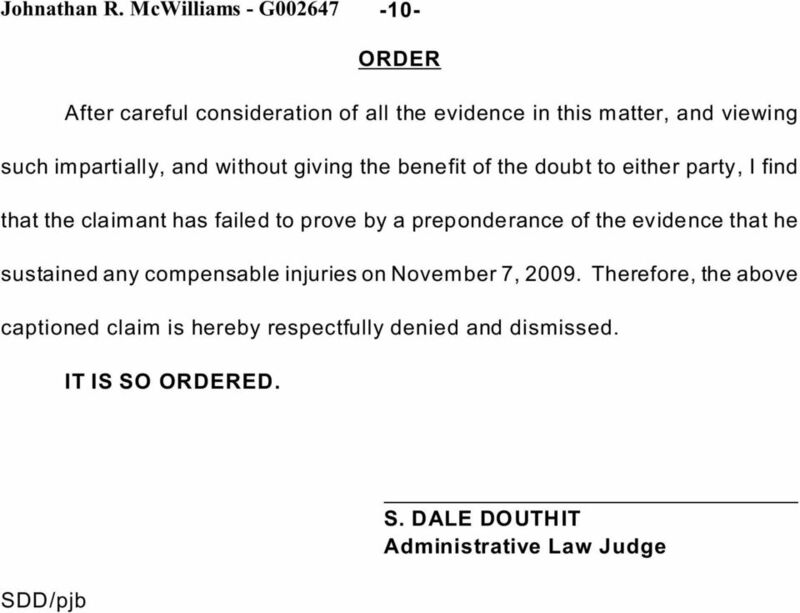 5) The parties stipulate that the claimant reached maximum medical improvement for his alleged compensable injuries on pril 14, The sole issue to be litigated at the September 7, 2010, hearing was whether the claimant was performing employment services on November 7, 2009, when he sustained injuries to his right foot, left heel, and a compression fracture at T11/T12 of his back. t the full hearing, the claimant contended that he sustained multiple compensable injuries on November 7, 2009, including but not limited to his right foot, left heel, and a compression fracture at T11/T12 of his back. 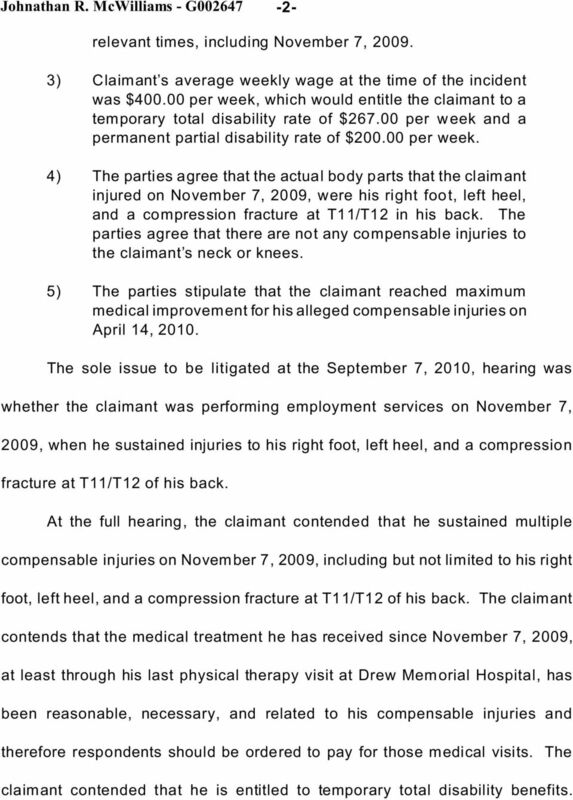 The claimant contends that the medical treatment he has received since November 7, 2009, at least through his last physical therapy visit at Drew Memorial Hospital, has been reasonable, necessary, and related to his compensable injuries and therefore respondents should be ordered to pay for those medical visits. The claimant contended that he is entitled to temporary total disability benefits. 4 -4- November 7, 2009, the workers on the roof agreed to take a break. 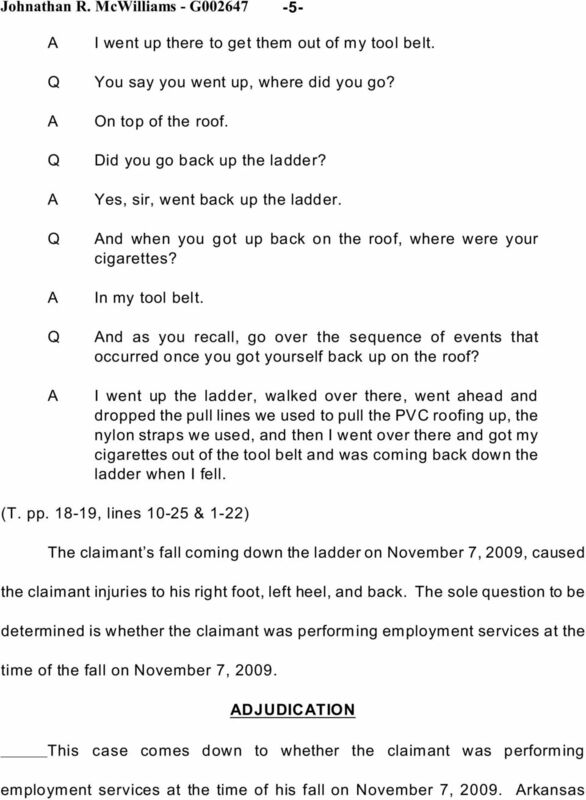 The claimant testified that the workers went down the ladder for the break. 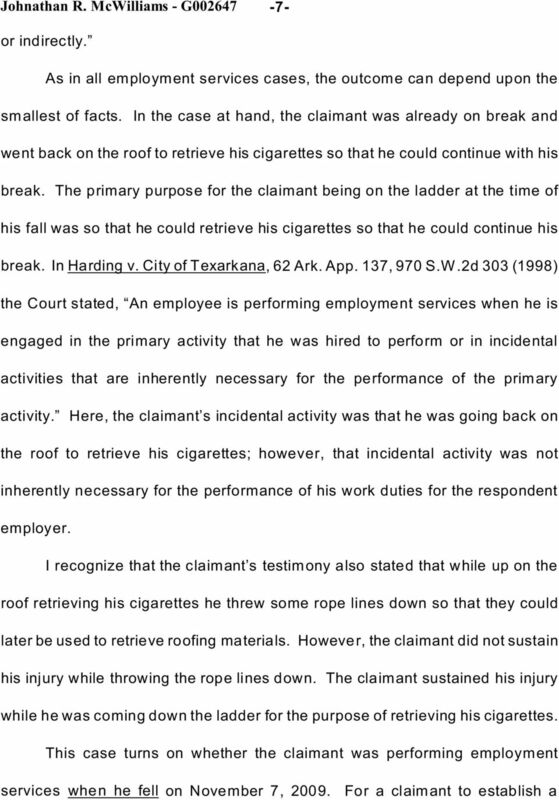 However, the claimant testified that when he got to the break area he realized he had forgot his cigarettes up on the roof. 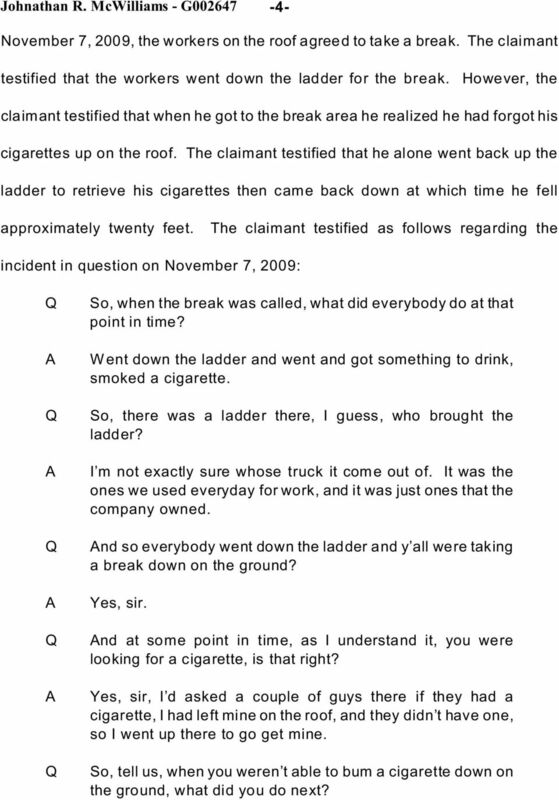 The claimant testified that he alone went back up the ladder to retrieve his cigarettes then came back down at which time he fell approximately twenty feet. The claimant testified as follows regarding the incident in question on November 7, 2009: So, when the break was called, what did everybody do at that point in time? Went down the ladder and went and got something to drink, smoked a cigarette. So, there was a ladder there, I guess, who brought the ladder? I m not exactly sure whose truck it come out of. It was the ones we used everyday for work, and it was just ones that the company owned. nd so everybody went down the ladder and y all were taking a break down on the ground? Yes, sir. nd at some point in time, as I understand it, you were looking for a cigarette, is that right? Yes, sir, I d asked a couple of guys there if they had a cigarette, I had left mine on the roof, and they didn t have one, so I went up there to go get mine. So, tell us, when you weren t able to bum a cigarette down on the ground, what did you do next? 8 -8- compensable injury as a result of a specific incident which is identifiable by time and place of occurrence, the claimant must prove by a preponderance of the evidence that the injury arose out of and in the course of employment. See.C (4)()(i). s stated above, the same test to determine whether the claimant was in the course of employment is also used to determine whether the claimant was performing employment services. W hen taking all the evidence into consideration without giving the benefit of the doubt to either party, I find that the claimant has failed to prove by a preponderance of the evidence that his injuries arose out of and in the course of his employment with the respondent employer on November 7, The claimant testified that had he not fallen he would have gone back to where his other co-workers were to have a smoke and then returned back to work. t the time of the claimant s fall he was en route to have a smoke break for the second time. (T. pp , lines & 1-7) In making this determination I do not overlook the fact the claimant was transported to the work site by his supervisor. However, my analysis would not change had the claimant had his own car available at the work site. 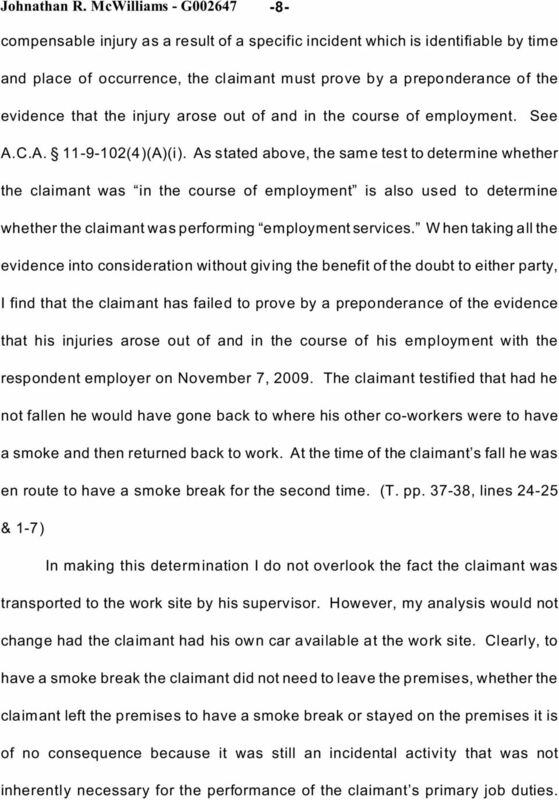 Clearly, to have a smoke break the claimant did not need to leave the premises, whether the claimant left the premises to have a smoke break or stayed on the premises it is of no consequence because it was still an incidental activity that was not inherently necessary for the performance of the claimant s primary job duties. 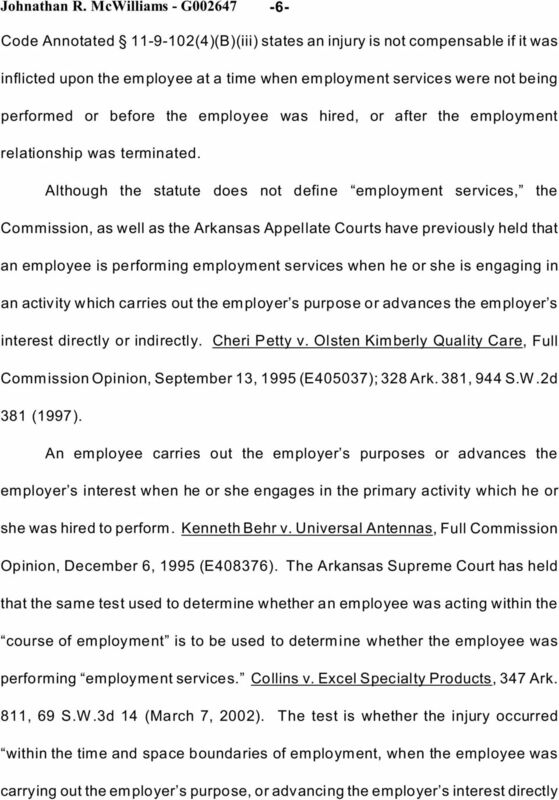 9 -9- lso the Court stated in Harding v. City of Texarkana, lthough appellate s break may have indirectly advanced her employer s interest, it was not inherently necessary for the performance of the job she was hired to do. Whether an employee is performing employment services at the time of an accident depends on the particular set of facts in each case. In this matter, I find that claimant has failed to prove by a preponderance of the evidence that he was performing employment services at the time of the accident. FINDINGS OF FCT ND CONCLUSIONS OF LW From a review the record as a whole, to include medical reports, documents, and other matters properly before the Commission, and having had an opportunity to hear the testimony of the claimant and to observe his demeanor, the following findings of fact and conclusions of law are hereby made in accordance with.c : 1) The rkansas Workers Compensation Commission has jurisdiction over this claim. 2) The stipulations agreed to by the parties are hereby accepted as fact. 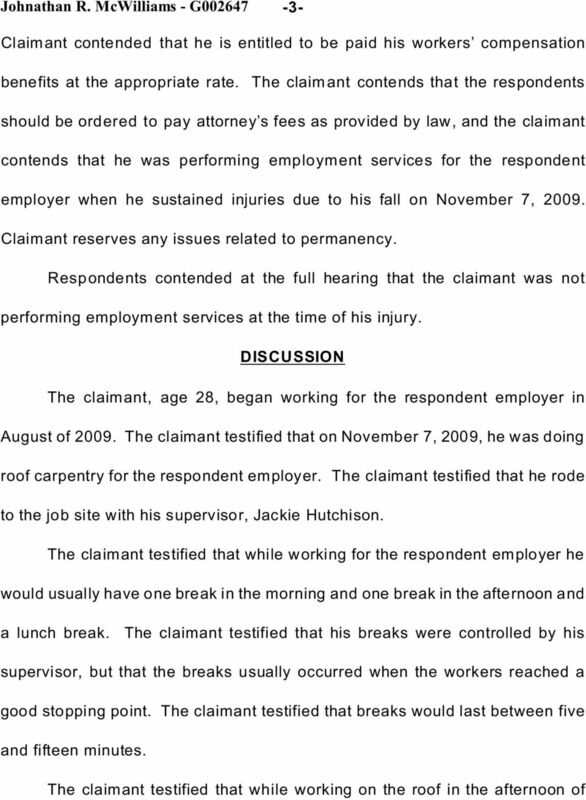 3) The claimant has failed to prove by a preponderance of the evidence that he sustained any compensable injuries as a result of a specific incident identifiable by time and place of occurrence on November 7, Specifically, the claimant has failed to prove by a preponderance of the evidence that he was performing employment services at the time of the accident. BEFORE THE ARKANSAS WORKERS COMPENSATION COMMISSION CLAIM NO. F909372 & G006718 BART A. WESTON, EMPLOYEE DOLLAR SHEET METAL, INC.
University of Tennessee, Knoxville Trace: Tennessee Research and Creative Exchange Tennessee Court of Workers' Compensation Claims and Workers' Compensation Appeals Board Law 6-28-2016 McQuiddy, Jana v.
BEFORE THE ARKANSAS WORKERS' COMPENSATION COMMISSION CLAIM NO. G100744 DONALD RAGSDALE, EMPLOYEE LVL, INC., EMPLOYER RESPONDENT NO. BEFORE THE ARKANSAS WORKERS' COMPENSATION COMMISSION CLAIM NO. G100744 DONALD RAGSDALE, EMPLOYEE CLAIMANT LVL, INC., EMPLOYER RESPONDENT NO. 1 TRIANGLE INSURANCE COMPANY, INSURANCE CARRIER RESPONDENT NO. 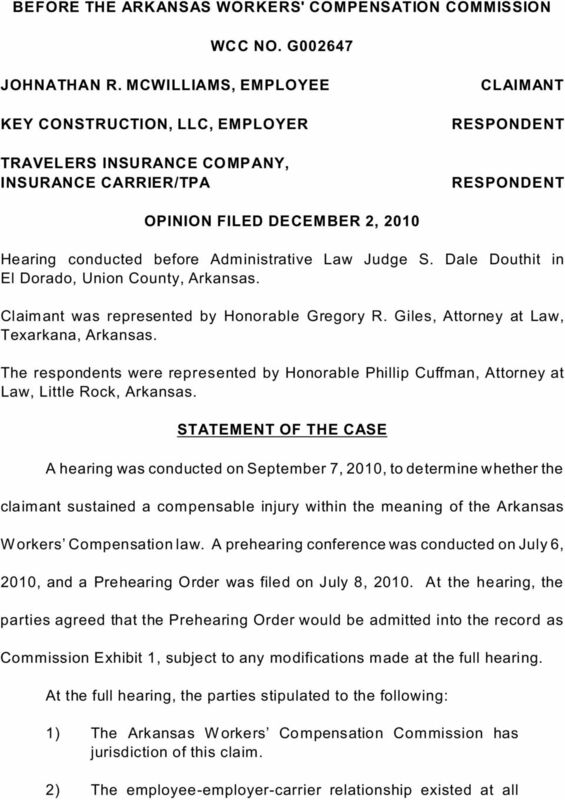 BEFORE THE ARKANSAS WORKERS COMPENSATION COMMISSION CLAIM NO. F107847 VINCENT E. BRADLEY, EMPLOYEE SINGLE SOURCE TRANSP. CO.
BETRICE ROBINSON, PLINTIFF, 2003 CO #177 S T T E O F M I C H I G N WORKER'S COMPENSTION PPELLTE COMMISSION V DOCKET # 02-0371 MGM GRND DETROIT, L.L.C., SELF INSURED, DEFENDNT. PPEL FROM MGISTRTE BRNEY. DECISION & ORDER BEFORE THE SOUTH CAROLINA WORKERS' COMPENSATION COMMISSION WCC FILE NUMBER 1007414 XXXXXXXXX, Claimant, vs. BIG LOTS STORES, INC., Employer, ARCH INSURANCE COMPANY, Carrier, Defendants.